With summer in full swing, we know many of you are on the go. Whether you’re traveling for your bucket list, to visit family or for a little R&R, C. Crane has a few things that you can use to make your travels more enjoyable. For news and information, the CC Skywave is hard to beat. It will also keep you informed of the weather with weather alerts. It’s the perfect size to stash in your travel bag regardless of your mode of travel. If you want something a little simpler, the CC Pocket might be the right choice. We’ve had several customers who mention using it on the golf course or by the pool. What fun is the destination without some music? The Senta Ally is a versatile portable Bluetooth Speaker. Use your smartphone with your favorite app to transmit music to the Ally or you can connect a device directly through the line in, or even load your playlist onto an SD card or USB thumb drive. This is great for the lake, on the patio boat, by the pool, at the river or the beach. It’s small enough to easily throw in your towel bag. Traveling to campgrounds or RV parks that have WiFi or even some hotels – the range isn’t always very good. Use one of our WiFi antennas or the Super WiFi Repeater Kit to get the range you need. We have a great explanation on the different options and how to pick the one that is best suited for your situation. If camping or hiking is more your style, the Unity Plus LED Flashlight is one of the best or even the Power Vivid Pocket LED Flashlight. Long battery life and easy operation. Everyone will be asking where you got yours. They are an essential part of the camping or hiking pack. 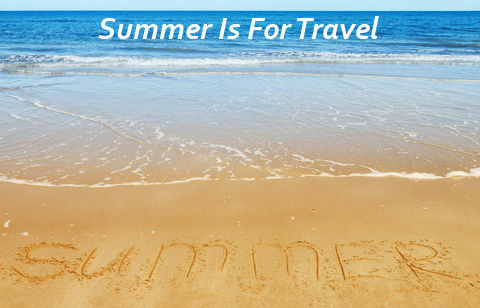 Wherever your summer takes you, we hope you make the most of it! We love a good story, and you guys have given us some great ones! Vacations are some of the best stories (sometimes for calamity). Tell us your favorite vacation story in the comments and be entered to win any one of the products mentioned above. One entry per person. Drawing will be held August 12th. I live in NE Ohio and have for my whole live. I have traveled/vacationed on the Outer Banks of North Carolina ,as a child with my parents1961to 1969 and as an adult with my own family1986 to present. I used a crystal radio and Zenith Royal 500 in my early teens. Most of my listening was AM radio stations of the south which were much more different from the steel valley of Ohio. Mostly rock and roll up north and southern rhythm and blues in the south. It was a wonderful cultural experience for me. Now my later years I still listen to my ‘at the moment gear-head’ group of radios, that always draws strange looks from family as I pack my toy/ gadget bag for vacation. More radios,flashlights, and a liteny of tools and EDC ‘stuff’ that is more that will ever be needed under the most extreme of circumstances. As with my youth,I still always go to sleep with a ear bud in my ear and a bag of ‘goodies’ close at hand. A wonderful life I have. I live outside of Toledo,Ohio and am blessed with great, clear, AM talk radio from Detroit, Toledo, Cleveland, and Columbus. With my constant ringing tinnitus about the only way I can get to sleep is listening with ear buds to clear late-night AM radio. Both my sons live in in areas of bad AM reception in Central Indiana and West When vacationing at my sons during the summer, I have discovered the answer to getting to sleep is to take along my trusty CC Radio Plus with its great reception and auto shut-off. so he was for basic training. He then went on to learn how to detonate weapons. works for a Stanford Hospital in their office and is a great young man. My favorite vacation story is from back in middle school in the mid 90s. My grandparents had a house on Cape Cod.. a beautiful two story house not far from the water. When we got to visit there for a week, it was so much fun.. for a week we had no care or concerns except having fun with the family. We slept in late, we ate what we wanted.. and my favorite part of all as going to a local ice cream stand for a cone with our favorite ice cream in it then going to the beach and playing in the sand and water for a bit. That was almost 20 years ago and I still remember it like it was yesterday, wishing i could go back. As a boy, I can remember taking trips to the “park” at Yellowstone and seeing geysers, bears, elk, tatanka, and deer. Always fun to spend time with the family. When WGST changed formats last year, dropping Coast To Coast AM and switching a Spanish sports format, I had to try to find Coast on another station. The nearest stations with at least 50 KW were in St Louis, Nashville, and Florida. The cheap little radio I had wasn’t keen enough to receive a useable signal from either station. I would have taken a much high quality radio to receive Coast from out-of-state. Several years back I was traveling north through California and camping at different gold prospector association claims & lost Dutchman mining camps. After leaving one out in the desert (finding a little) I started my way up towards the camp near Columbia California, On the Stanislaus river, half way through that leg of the trip I decided to pull into a truck stop for the night. I was able to get WiFi off a fast food place across the street by sticking my tablet in my window but only if I parked close enough to the entrance far from the regular RV parking. I went to go buy a shower at the truck stop and decided to walk my dogs first. My oldest dog was so excited I didn’t get the leash clipped on his actual collar ring but one of the keychain rings that held his tags. He pulled that ring straight and took off : ( now being up near the entrance he went right out into the street, up the road and onto the interstate 5 against traffic via the offramp. The whole time I’m running after him while being overweight and out of shape. Thankfully a trucker saw him and stopped his truck at the entrance of the off ramp preventing anyone else from getting off and he caught booboo while he was trying to poop in the bushes on the side, he held him there until I caught up then drove us back to the truck stop,,,,,AND he let me use one of his shower credits lol. I changed the rings for his tags to smaller ones so that won’t happen again and I’m always extra careful especially when I park my RV near the road. I found a little gold that summer not even 2 grams but it was still mostly fun. i started at an early age with a zenith table radio listening to wwva am radio in eastern ohio,when i was 10 i received a 6 transistor rca radio for christmas.i have listened to radio my whole life .wbz boston late at night sometimes came in if the weather was right,i listened to the beatles.when i was 11 or 12 i rode on a milk route with my uncle picking up big cans of milk to take to the dairy.we always stopped at noon to eat lunch,fried ham sandwiches on homemade bread and we always listened to Paul Harvey News,that started a habit with me listening to Paul Harvey News 6 days a week on am radio.i still miss his broadcast.i still listen to radio am and fm almost every day.a fm radio would help me pick up a local station that is low power WWOV jamboree radio in Wheeling,wva. Hello CCrane, our favorite radio company. This July we traveled to Northern California, Fortuna to be specific. My wife was born there, and we went to visit her father, and other family members, as well as the beautiful redwoods and the pacific ocean. This was my first trip to Fortuna. Being a big fan of CCrane, and having purchased items over the years, such as, an antenna, FM transmitter, CC WIFI, I wanted to visit the actual store. We stopped into the wonderful ACE Hardware store on main street, and asked if they could direct us to the CCrane store. We got directions, and drove down around the curve, and found our destination. We were greeted by a helpful young lady, that offered to find us a guide, after I told her we were just being tourists. I told her it was okay, we would just be there for a few minutes, and looked at the displays that were in the lobby. She then gave us a CCane catalog and thanked us for visiting. On our way to hit the ATM at US Bank, I happened to see the old CCrane store. This was a bonus! It was a great trip, and I can hardly wait to visit Fortuna, and possibly CCrane again. And, I should thank Art Bell and Dr. Bill, because if I hadn’t listened to them over the years, I probably wouldn’t have discovered your great company. I live in a small western Alaskan Village, where there are no roads connecting us to any other place. Moose season (September) is my vacation. I get to camp out and hunt. I bring along my radio and pull in A.M. stations from Nome, Anchorage, from cities along the Western United States’ coast, from Russia, Japan, and points unknown. Bedtime radio is fascinating because I can pull in radio stations from many different places. I enjoyed Florida and the Kennedy Space Center and its exhibits in 2004. There is a ham radio talkie on display used by Owen Garriott for the first communication from the Shuttle on 2 meters. I received his signals as he flew over my home in Dallas. the first trip to Disney World was just the best. We only had one child and when we decided to take him we also decided to take his cousins, one his age 10, and another 13, because it would be more fun for him. I have so many great memories it is hard to pick one but suffice it to say that when the words Disney World are mentioned all three of them break out in the biggest grins and the stories start going and the laughs are just as big as when they were 10 and 13.The kids are are now in their late 40’s so we must have done something right. My favorite and most memorable vacation was driving by car to the area where my Grandfather “homestead” the family land. My Father wanted to see the farmland one last time. When we arrived on that open prairie, the family home was gone. All that remained was a vacant lot. My Dad walked all around that plot of land as one would when “going home”. As he looked down on the ground, surprisingly, there among the tall weeds, was a piece of the exterior wall to his childhood home. He emotionally picked up the piece of wall while my Mom captured that black and white Kodak moment. To this day, many, many years later, my heart is touched when viewing the only photo of my Dad “Going Home”.